Finland - land of a thousand lakes – or, in reality, closer to 200,000 – and trees, lots of trees. You know the Beatles’ song, The Long and Winding Road? Well, in northern and eastern Finland it doesn’t wind all that much, largely due to being built in the 1950s as part of an effort to provide employment during a time of economic depression, and it passes by lakes, and great stands of towering conifers, mainly spruce, like spindly candles pointing skywards, with birch trees mingled among them, their white and black striped trunks shining out. It doesn’t make for variety and the effect while driving along is mesmerising. After Norway, our initial feeling about Finland was that it seemed flat by comparison – in all sorts of ways – and we spent much of our first week seemingly driving through the same forest, for about a thousand kilometres. In fact, the stripy tree background became almost soporific – and the last thing you need to do in the van is nod off, not with all the reindeer (in the north) or elks (everywhere, but mainly in the evening). So our first impressions of Finland were lakes, trees and reindeer with absolutely no traffic sense. Although the reindeer all belong to people, they are allowed to graze freely, which accounts for the average of 8 traffic accidents per day involving reindeer. They seem pretty tame too, almost touching the sides of the van at times, although none would come to take a carrot from me. Actually, Finland is not at all flat, just low-lying, and a drive through the country will reveal a crumpled landscape of hills and ridges, just none of them very high, and many of the gaps filled by lakes large and small. I think it’s fair to say that the charms of the Finnish landscape are of a more understated and unvarying kind than those of Norway, and 100 km driven in Finland does not elicit the same ‘oohs’, ‘ahs’ and ‘wows’ that 100 km in Norway tends to. Yet there was some variety in the northern landscape, it was just that a lot of it is hidden by trees. Lapland has fells – massive hump-backs of bare granite, which largely seem to have been taken over by ski-resorts and hiking routes (the tourist brochures reckon that Nordic walking was invented in Finland). Lower down these slopes the woodland floor is boggy or sandy; we saw great drifts of inland sand dunes near Enontekiö, and most of the areas were covered in low growing bushes of juniper or bilberry, which offered more gathering for food in the form of berries. The Lapland fells harbour a number of national parks, and we spent our first two days in the vicinity of one of these, called Pallas-Yllästunturi (tunturi just means ‘fells’). A chain of bare-topped rounded hills rises in a line above the endless forests and lakes in the northern part of the park, while the southern part concentrates more on forest walks. I (Rob) set off up to the fells one afternoon, but was beaten back after reaching just one top by a thunderstorm, and the dog and I trudged through some very boggy forest back to the van. Charlie also discovered reindeer on this day, and was a nightmare on the walk as he squealed on the end of his lead to be let at the groups of deer grazing peacefully on the slopes. The excited yelping continued for a few days from “his” seat every time we passed reindeer on the roads, but eventually even the dog tired of trees and lay on the floor (it was the first time he’d given up that seat for weeks). We stopped en route at a number of rather modern and nondescript towns on our way down the eastern side of Finland – Sodankylä, Kemijärvi, Kuusamo – which had all been rebuilt after the second world war. 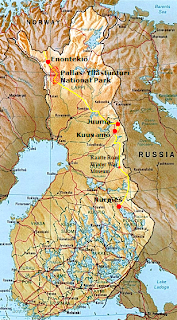 This eastern strip of the country had narrowly escaped incorporation into the Soviet Union in 1940, a fate which had befallen much of the historic province of Karelia, half of which now lies beyond the frontier with Russia. Along the route from Kuusamo southwards we were never far from the Russian frontier, and saw a large number of Russian cars, many of them clearly on holiday just as we were. 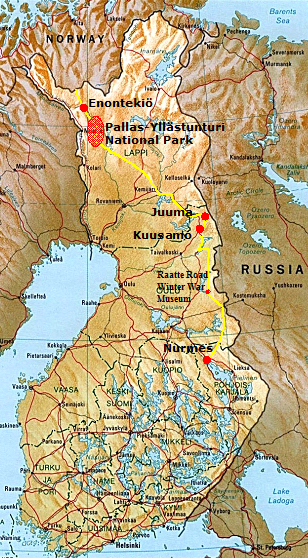 The border area also contains a great many memorials to the Winter War (Talvisota in Finnish) of 1939-40, when the Finns initially gave the invading Red Army a bloody nose, but were forced to endure the painful loss of eastern Karelia when the Soviet Union regrouped and attacked again the following spring. We passed back over the arctic circle almost without realising it, for unlike on the E6 in Norway there were no markers (unless the 30ft high inflatable Santa outside someone’s house was a sign), no visitor centre, no crowds of people, and we only spotted the event on the map a few miles later. We stopped for a couple of days at a campsite at Juuma, in quiet country near this border. It lay on the edge of the Oulanka national park, and people came here mainly for fishing or hiking. Juuma is near the mid-point of an 80 km hiking train called the Karhunkierros, or ‘Bear Trail’ (although the bears themselves are particularly elusive, and seem to prefer the tranquillity of the border strip itself, where noisy hikers are not allowed). There is also a short, 12 km circular variant called the Pieni Karhunkierros (‘Little Bear Trail’) starting and ending at Juuma, and I (Rob) walked this one afternoon. It was a particularly lovely walk, and I had not expected so much variety of scenery in Finland. The trail itself was well maintained and easily followable, but led up and down steep inclines, including clifftop viewpoints 200 metres or more above forest or river, or through untouched forest rich with fallen trees and mosses. The river Kitka ran through a real gorge, some kilometres long and lined by vertical cliffs, and passed over several sets of rapids and waterfalls. You needed to get this close to appreciate this landscape, for from a distance all these features would have been hidden, subsumed in a mass of gently undulating forest. Eventually on Thursday 19th we drove down a hill to the lake-end town of Nurmes, and knew immediately that we had entered a new area. The infinite forest suddenly opened to clearings and farms, and on entering Nurmes we realised that these were the first older buildings (with the occasional exception of a church) that we had seen since Tromsø. It was only a small place, but the road into town passed through a tree-lined neighbourhood of homely wooden houses with decorative touches, making the town strikingly more attractive than any we had seen to date in Finland. We had reached the start of the Finnish lake district. The other really striking feature of heading south was stars. Yes, those twinkling, diamond points of light were back, which meant so was the night and it heralded Rob’s accompanying moans about shorter days, driving too late, needing to camp earlier and so on. Along with dusk falling earlier and earlier – by 11 p.m. at Juuma, and 9 p.m. by the time we reached the lake district, everything else seems to have taken an autumnal turn too – the weather can be hot, but the air is developing a slight chill, and it’s also raining a lot - there are golden leaves on the birch trees – the fields are stubbly and shorn. Autumnal treats? If only we’d packed our mushroom book! Maybe it was the idea of shorter autumn days that started us off, but it was about this time that we once again began to be concerned by our lack of gas. The 5kg Statoil bottle we’d given in and bought in Norway, with the assurances of the caravan centre chap selling it that he thought there were Statoil garages in Finland, was surely near its final dregs. A trawl of the internet from Kuusamo tourist office had left us sure there were no Statoil garages in Finland, (there are some in the Baltic states, so we will keep the bottle and see it we can exchange it or get a refund there) and another lengthy trawl of the internet in yet another supermarket car park informed us that there seemed to be few Camping Gaz 907 stockists in Finland either (there might be one in Helsinki, but we’re not holding our breath). We always knew gas in Scandinavia was a potential nightmare and we seemed to be back to the dilemma we had in Norway – do we buy another type of gas bottle & another regulator – or could we eke this lot out until we get to Estonia’s streets paved with golden Statoil gas bottles (they are bright yellow – poetic licence here)? We are eking out. Staying on the campsite at Juuma and on another at Karvio were a great help as all campsites seem to have a basic kitchen for use by campers and some sort of BBQ grill hut, with wood provided. It meant running across a campsite with the coffee pot, but hey, the gas is eking. We may have annoyed three Finns who only wanted to grill 6 sausages, but had to wait for our fire, needed to boil veg, to die down, but again – the gas – eking. Ray Mears is back though, and doing a grand job making little fires in wild camping spots, even in the wind and rain, on which we make coffee and dinner and the gas… well, it’s still the big yellow bottle – we haven’t had to eat into our reserve of Camping Gaz as yet – watch this space! You wouldn’t have got Charlie dog (or Lesley) across this on the Little Bear Trail! Now the only problem with doing such a detailed and well researched blog, with lots of pictures and additional information from t'internet is that you have to keep it up-to-date. For the lazy git's approach to blogging, see wendyandbob.wordpress.co.uk. Will be reading your blog to find out about all the bits we missed. 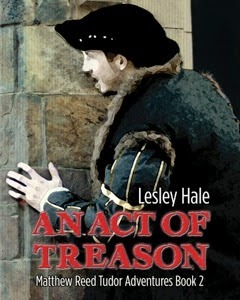 See you in Poland, or the Czech Republic, or even Burbage.